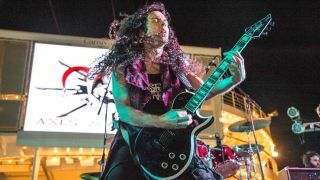 Jackson Guitars has announced that guitar icon Marty Friedman has returned to its fold. The former Megadeth man will release an all-new signature model with the brand at NAMM in January 2017, over two decades on from his 1996 Kelly-derived signature. "From the first time I saved my money as a teen to buy a Jackson to the day they released my first sig model Kelly, there was always an aura of greatness about the brand and the instruments," enthuses Friedman. "Even more important than that, the people at the company have always gone way beyond the call of duty to help me pursue my musical goals - even when I was not officially working with the company. That speaks volumes to me. "My longstanding relationship with Jackson gave birth to my new sig model, which was a massive project for both of us. It's a guitar that can hang with the most aggressive playing possible, as well as allows tender interpretations of melodies, two major elements of my music. Oh, and it looks badass, too." Up until this year, Friedman could be found playing his PRS signature model. Jackson's obviously doing something right at the moment: Gus G and Slipknot's Mick Thomson both signed up with the company this year, jumping ship from Ibanez and ESP respectively.